The Global Volcanism Program has no activity reports for Harrat al Birk. The Global Volcanism Program has no Weekly Reports available for Harrat al Birk. The Global Volcanism Program has no Bulletin Reports available for Harrat al Birk. 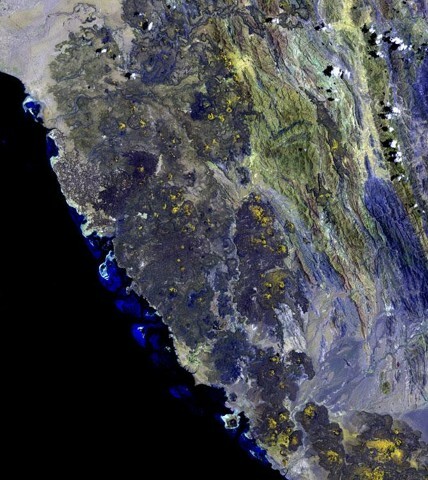 The Harrat al Birk volcanic field, also known as Harrat Hayil or Hubhub al Sheikh, is the only Saudi Arabian volcanic field that lies directly along the Red Sea coast. It covers an 1800 km2 area west of the town of Abha and separates the Tihamat ash Sham and Tihamat 'Asir coastal plains. Volcanic activity dates back to the Miocene and concluded with the formation of Holocene cinder cones (Brown et al., 1984). The Quaternary lava flows are of basaltic to trachybasaltic composition and contain ultramafic inclusions. Cinder cones are scattered throughout the volcanic field, with a few late-stage cones (Ba'a and Qishr) NE of the main lava field. Isolated patches of freshly eroded ash surround a vent at Jabal Ba'a, east of the main field, suggesting an eruption during the last century. Camp V E, Roobol M J, Hooper P R, 1991. The Arabia continental alkali basalt province: Part II. Evolution of Harrats Khaybar, Ithnayn, and Kura, Kingdom of Saudi Arabia. Geol Soc Amer Bull, 103: 363-391. The Global Volcanism Program is not aware of any Holocene eruptions from Harrat al Birk. If this volcano has had large eruptions (VEI >= 4) prior to 10,000 years ago, information might be found on the Harrat al Birk page in the LaMEVE (Large Magnitude Explosive Volcanic Eruptions) database, a part of the Volcano Global Risk Identification and Analysis Project (VOGRIPA). There is no Deformation History data available for Harrat al Birk. There is no Emissions History data available for Harrat al Birk. 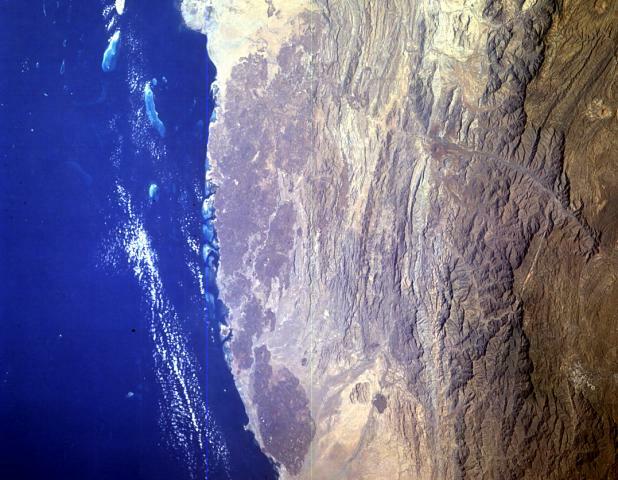 The Harrat al Birk volcanic field forms the dark-colored area between the Red Sea coast and the center of this NASA Space Shuttle image (with north to the upper right). This 1800 sq km Miocene and Quaternary volcanic field separates the Tihamat ash Sham and Tihamat 'Asir coastal plains. Cinder cones are scattered throughout the basaltic volcanic field, and a few outlying cones lie east of the main lava field. NASA Space Shuttle image STS055-151-184, 1993 (http://eol.jsc.nasa.gov/). The Harrat al Birk volcanic field extends diagonally across the center of this NASA Landsat image along the Red Sea coast. Dark-colored areas are lava fields of this 1800 sq km Miocene and Quaternary volcanic field, and yellowish areas mark pyroclastic cones and deposits. Cinder cones are scattered throughout the basaltic volcanic field, and a few outlying cones lie east of the main lava field. NASA Landsat image, USGS, 2003. There are no samples for Harrat al Birk in the Smithsonian's NMNH Department of Mineral Sciences Rock and Ore collection. Large Eruptions of Harrat al Birk Information about large Quaternary eruptions (VEI >= 4) is cataloged in the Large Magnitude Explosive Volcanic Eruptions (LaMEVE) database of the Volcano Global Risk Identification and Analysis Project (VOGRIPA).